The following “Quiz” is meant to follow up on the conversation begun with Positions 1 and brought to a boil with Postions 2; please play along and answer at least one of the questions in the spirit in which it is posed before expanding on your own ideas. Poetry and haiku are completely different. Poetry and haiku are indistinguishable. 2) Is this a haiku? Please discuss your answer, using these questions as a guide: Why is/isn’t this a haiku? If it is a haiku, why? If it isn’t a haiku, what could you do to make it a haiku? Why would you want to do this? 3) Is this a poem? Please discuss your answer, using these questions as a guide: Why is/isn’t this a poem? If it is a poem, why? If it isn’t a poem, what could you do to make it a poem? Why would you want to do this? …what gets lost in translation. …not the record of an event: it is an event. …should not mean but be. …just the evidence of life. …a Japanese lyric verse form having three unrhymed lines of five, seven, and five syllables, traditionally invoking an aspect of nature or the seasons. …minimally brief, semantically enfolded, clever, surprising, resistant, collocationally unusual or unique, mysterious, suggestive, humorous, clashing, disjunctive, irruptive, rhythmic, imagistic, sensual, and has a readily understandable vocabulary. …debased products of the university workshop system. 10) In conclusion, which of the following appear to be true? Matthew M. Cariello teaches in the English Department at Ohio State University; his essay on metaphor may be found in the 2010 summer issue of Modern Haiku. The only way to approach the essential mystery of true haiku is through an instrumental understanding of MA. If this is not clearly understood, both intellectually and in application, most theories of haiku are simply nonsense. To be fixated, as in a stupor or trance, by a flat earth notion of things is reassuring. Only natural that any challenge to our cognitive comfort zones tends to produce dissonance, followed by a flurry of denial and/or aggression. Nevertheless, we all need to be brave and, for the sake of future generations, scrape the barnacles off of global haiku, for fear that our ubiquitous little boat of fast-track enlightenment for the people, sinks under the encrusted weight of an appallingly ignorant and spiritually opaque received ‘wisdom’. Hi Lorin, and thanks for sending me back to Four Quartets: a work to return to, for sure, with renewed sense of surprise and recognition (well, at least in parts!). I particularly like your sense of “the kind of spaciousness in which connections seem to come of themselves rather than connections we have to ‘figure out’.” As you say, there’s “much musing and spelling out” there too, though much of that is very compelling; hardly a matter of “opinion” (to borrow a word Paul used in connection with Longfellow), but profound, sustained thought. Committed haikuists sometimes sound suspicious, even almost dismissive of anything other than direct presentation of the thing, etc., but passages such as the one beginning as below (from the 1st of the Quartets, ‘Burnt Norton), show, I hope, that to go from Eliot’s musing on non-duality to passages in the poem such as those you quote, or to haiku, may enhance appreciation of both kinds of poetic utterance. I can only say, *there* we have been: but I cannot say where. ‘Four Quartets’ is written in a variety of verse styles and voices which work like counterpoint in music, and Eliot was a pioneer of the ‘Modern’ period of poetry, early to mid 20th century. The ‘Modern ‘ poetry followed (and tolled the passing bells for) the previous Victorian and Georgian styles of poetry. This is not to say that the poems of eg Matthew Arnold, Tennyson (in England) and in America, Longfellow are ‘no good’. It simply means that times, and human consciousness of the world, had changed so much that it was no linger viable to *write* more poems in the old way. There was the First World War. It changed things! These lines are not, of course , haiku, but I find in them (in the two distinct parts, that of the observations of the natural world and the statement about self which builds like a slow swell on an otherwise calm dawn sea) the kind of spaciousness in which connections seem to come of themselves rather than connections we have to ‘figure out’. (and in Four Quartets there is much ‘figuring out’, much musing and spelling out and interior monologue) I also find that these lines are a short poem, despite the fact that they are part of a much longer poem, a sequence of four long poems. There is also a sense in which I find haiku to be like the various ‘voices’ , in harmony and in counterpoint, which Eliot brought together in ‘Four Quartets; and ‘The Wasteland’. Different to renga/ renku, which are collaborative poems, haiku are still usually read with, or at least in relation to, other haiku: though each ‘stands alone’, each memorable haiku gains resonance from other memorable haiku, other voices. Paul, thanks for the intro and insight into Longfellow, whose work I’ve hardly read. I’m not sure how apt the comparison with late 20th and early 21st century haiku is, though. I agree that good haiku tends to do little of the ‘telling’ found in lines like “skeletons of leaves … Shuddered and danced their dance of death”; but it is unlikely that any writer of image-based poetry, post-Pound, would write that way. You show how an appreciation of Longfellow’s writing can relate to, and so enhance, an appreciation of haiku (particularly that of the mainstream American variety). And more could be got out of consideration of haiku in relation to more modern poetry. I find it hard to agree that “such discussion” does not “have much to do with haiku.” That may be so, as you say, “in the general sense” (when it comes, I mean, to generalizing about haiku), but when it comes to the specific ways in which haiku works as poetry? I agree, it is “hard enough to discuss haiku,” but does it necessarily get harder if one tries to see it in a broader view; to speak, that is, as readers and writers of poetry, with a particular interest in haiku? I find it hard to see how it is possible to speak realistically of haiku in English alone, as though it had little or nothing in common with other poetry in the same language. Sorry to be brief (it’s late here); likewise, if I’ve misread any of your comments. I’d be interested to know who the *we* are, who say this. Or are you using the Royal pronoun? True haiku is of and in the present, the now. Yesterday and tomorrow may only be implied. Eternity is always the background, from our time-bound perspective, that is. This becomes apparent as we enter the now. We stand between two worlds of experience The living moment of immediate perception allows this when we do true haiku. This is why we address the now. All the rest follows, naturally. This is the primary juxtaposition* which ensouls the living moment’s intuitive presentation of contrasting sensory entities. This is peculiar to haiku, Zen haiku anyway. This is why we say: “True haiku is a form of literary magic (NOT literary art, where poetry abides) and true haiku is it’s own distinct genre, therein.” Of course we use minimal poetic and prosaic devices to indicate (signpost), clearly and without embellishment, the living image of a true haiku in words. Do not be confused into thinking that this means true haiku is a poem or a prose piece, this would be perpetuating the great error. A true haiku is a set of magical instructions. A form of Zen sorcery, some might say. A benign spell. *Between separate and combined we have ‘juxtaposition’. Hi Philip. I appreciate your question. I used capitals for a purpose, and might, in retrospect have modified the tone the capitals send (to some). My sentence might even do well without the first one, “OUR,” entirely. Yet the point I tried to make and emphasize still holds for me. I was  motivated to indicate that haiku poets, and “this” haiku poet write, commit to paper, or to read (as many now do in recording) aloud… a haiku. If as I believe Art is expression, then creator and perceiver are more than implied — they are necessary to Art. Communication has participation, even if passive. Art can run the gamut of sound (speech and music), sight (words and visual art), even touch, if museum directors, and their guards, allow touching sculpture for example. At least when I visited, the Dallas (Texas) Museum of Art had a central display of stone sculptures by British artist Henry Moore. One can tell by looking, but oh! to touch the smoothness, and sense the curves he used is wonderful (and allowed there within reason). In haiku, unlike at least some kinds of other poetry, the point is to not give much of the mind/ opinion of the haiku poet. I absolutely do not profess any expertise on other forms of poetry. I do not think such discussion has much to do with haiku in the general sense. Plainly both forms use our language and many skills of expression. The sound of a haiku, the pace, the order of elements, the focus, the placement of the poet/observer — are all variables manipulated consciously or unconsciously. If a poet of, say… the stature of Longfellow (at one point the most famous American in the world) can spend stanza after stanza in pure description in a sense of Charles Dickens (the most famous Englishman in his time) filling a novel’s page with one paragraph which is at once only one sentence. Perfectly punctuated. Well I feel I was there. How smoothly he works all into 8-meter … well maybe except the poetic contraction of “over.”  We also get a dose of the poet’s imagination in his metaphors. He tells/instructs us what to feel. Strongly seasoned, late fall, early winter…. in Sudbury Massachusetts, a day’s ride by horse from Boston… on the “road” to Connecticut and New York. Longfellow has pace, and mellifluous sounds if you’ll read it aloud to yourself. The Inn and bar room are still there to visit. [pwm again] Forgive the extent of the digression. One can certainly understand H.W. Longfellow’s feeling here. It is all laid out and explained; metaphor rampant. But the language is masterful. Again, read it aloud. One of my favorite lines: Still stands the forest primeval. The whole of Evangeline is quite a story, too. The English kicked the French settlers out of Eastern Canada… forcibly resettled many to Louisiana… and “Cajun” French was born. The forest on the coast of, and the ocean is the North Atlantic and the Gulf of Maine/Bay of Fundy. In a sense, haiku is a poetry that invites participation. Some subject material will not be accessible to all people. Yet, the haiku poet bears a bit of responsibility to show something, w/ enough detail, that might at least be imagined by a reader. A haiku with one image as, wild example, a cardinal sitting on a garden bench…. may not be understood as a bright red songbird, rather as a red-hatted Catholic prelate. Slightly different is to use redwing  –with — blackbird at least in the US. In Europe redwing might suffice, especially if flight is mentioned or implied. One cannot be successful if too “bare bones,” or unnecessarily confusing. To the extent that a haiku, a brief thing, can invite a reader/listener in, perhaps to voyage around a bit in the image(s), perhaps to find the flick of recognition, the awareness of a synthesis, an interaction of the haiku’s elements, then can its success be measured as communicating by sharing. “Other poetries” Philip? Not for me to say. Hard enough to discuss haiku. This idea of sharing interests me; writers of haiku often appeal to it. Would you say that haiku, being so brief and so often to do with “the bare bones of our experience,” invites the participation of the reader/listener more keenly than other kinds of poetry? (I am thinking not only of haiku’s lending itself to linking and collaboration, but also how it tends to work as a free-standing poem.) And/or – as your emphasis might indicate – are you suggesting that such bare-bones experience is somehow more “ours”, more essential or shareable, than that shared by other poetries? “Folks, please move on. if it doesn’t have to do with the actual post, or is in that general vicinity, then i’m going to have to start playing the role of placing posts in the trash. and if things continue, then i’ll have to place your posts in the spam filter and no one will read your posts on this log again. please stay on topic and make nice and stuff. Days ago, I wrote a rather lengthy piece to the points, and also responded, rather politely I feel, to intellectually challenging contentions by “The Haiku Master.”   Despite my asking him politely, and even lightly and humorously, he did not identify himself or reply to the serious points of my essay. Several other writers did. He seemingly is actually named John Potts. Now, as he says, haigo have a long tradition. And John (Potts), most of us do know the word… it is the beginners that may not. No need to wrap yourself in the cloak of Old Basho himself. I am still confused by your contentions about “true” haiku (as opposed to untrue haiku?). magical haiku, and haiku not being poetry. I asked before, a few days ago — yet I think “magical” has appeared, popped up, since then. Let’s agree I add it to my queries. You also mention in the same breath… that your haigo may be ironic, but may be based upon truth, a serious thing. Scott, I’m not interested in character or scholarship besmirchment, rather in the discussion John touched off with haiku not poetry, magical haiku, true and untrue haiku, etc. I do not mean haiku veteran as one with any greater skill than some newcomers, but it might help for some openness to allow both veteran and beginner to learn of the standing of a Master making interesting but controversial statements (correct, true, or otherwise). Those with good memories may recall I agreed with at least two of John’s assertions. I “don’t know from Twitter or Facebook”  — pardon the vernacular. Say what you mean right here, defend, attack, or agree. Moses brought down the 10 commandments (10 Haiku Commandments?). Didn’t he wander the Negev for 40 years, and never did see/cross the river Jordan? Ha! Sorry, I couldn’t resist the humor, even if off-topic. Pace, Scott. I hope we all can have a lighter tone. folks, please move on. if it doesn’t have to do with the actual post, or is in that general vicinity, then i’m going to have to start playing the role of placing posts in the trash. and if things continue, then i’ll have to place your posts in the spam filter and no one will read your posts on this blog again. So haiku *is* poetry, now, is it, John? ‘Magical poetry’? Well, maybe we’re getting somewhere, though that somewhere feels to me to be a bus stop somewhere in the foggy marshlands between Martin Lucas’s ‘poetic spell’ and Ken Jones’s ‘existential magic’,  where we might expect to be entertained by the old pea-and-thimbles-trick. Haigo : A haiku writers pseudonym or haikai pen name. This haigo business has a certain bearing on *haiku as magical poetry* (my current–provisional–solution for what a true haiku is). The adoption of a name which examples a specific personality state is common practice in the history of human cultures. Think: ritual mask. It’s based on the fact that we become what we think and influence as we appear. It’ may also be used to service good natured irony. Well, ‘Free the Haiku’ , whomever he/ she might be, did everyone a favour by clearing up any doubts about ‘The Haiku Master’ being another avatar of John Potts, who has a reputation which has preceded him even unto the Antipodes. The reputation is not for his wisdom on the subject of haiku. Thank you, FtH, for confirming that. The Haiku Master – why the deliberate antagonism aimed at Sandra? Lorin, Philip, thanks for picking up the debate here. I have some thoughts and questions of my own which I hope to share in due course. Sandra – I agree, it would be nice to keep the personal spats away from these comment threads. Megan – I shouldn’t let that comment get to you, “Free the Haiku!” is a one-off poster so far as I can tell. On the matter of whether anyone is simply falling into tired old philosophies or actually thinking for themselves… so far as I can tell the whole point of this website, unlike some others, is to encourage thinking for oneself, and being actively critical of the ‘old and tired philosophies and theories’. That’s why there’s so much lively debate here, and so many interesting articles such as the one we are commenting below right now. Speaking personally, I, would appreciate personal spats being kept in some other part of the web. Also, I don’t wish to read coarse language. In response to the quoted post below: Anyone who knows mmm, Megan McMurray McGowen, will know that she is no sychophant (sic)! Clearly the author of this defensive and angst ridden post (who I have no knowledge of) is feeling threatened by anyone who has a opinion that differs from his/her own. Too bad ….so sad that anyone who THINKS for themselves, instead of resorting to old and tired philosophies and theories, is regarded in this way. Cowards always hide behind nom de plumes ….never have the courage of their convictions. They remind me of yippy-yappy little dogs that go for ones ankles, and then piss themselves when they get a response. Stand up and be real, Free Haiku. John Potts thinks of himself on a high horse . he wants his sycophants like -mmm and her sock puppet to try and control individual freedom and brilliant potential haikuists. He is known by reputation as a bully,he needs to chill and quit destroying the writers out there. He spams every place he visits ,just bad manners He needs to quite himself by looking in the mirror and apologize for his ego. Freedom for the Haiku and shame to any master that thinks he can control her. An email source, in response to my comments on this otherwise somewhat predictable thread, informs us that calling a Haiku a poem is like calling a butterfly a leaf. On just the one point. I primarily write free verse, but also haiku. My best free verse is image driven and ‘happens’ in the present tense, two components of haiku that have helped me immensely. I have no problem in calling haiku poetry. It’s simply one form of poetry. But judging by this last post of yours, you don’t seem to be an experienced teacher of the English language, nor even a competent copy editor. 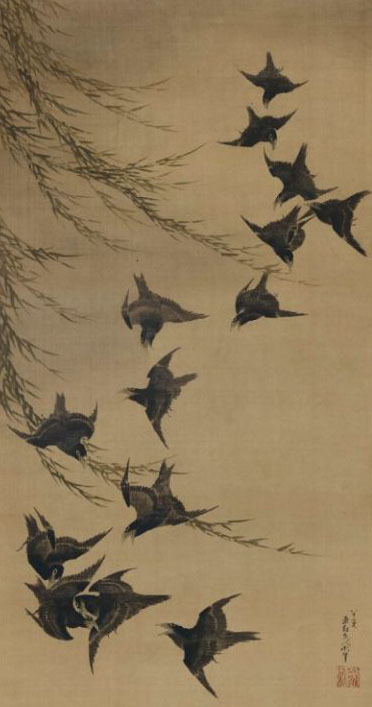 For a title or a slogan or an adopted name for a movement, it is quite correct to have it as ‘Freedom for the Haiku’, quite as correct as your ‘The Haiku Master’. All of which you surely must realise. The word haiku is spelled: *haiku’* – no first letter capital, unless at the start of a sentence, of course. Common mistake, The reason –for the scientist types among us– is that haiku is NOT a proper noun. he wants his sycophants like -mmm and her sock puppet to try and control individual freedom and brilliant potential haikuists. He is known by reputation as a bully,he needs to chill and quit destroying the writers out there. He spams every place he visits ,just bad manners He needs to quite himself by looking in the mirror and apologize for his ego. Lorin, thanks for posting Peggy’s wonderfully concise and vivid haiku. Are the words of haiku not chosen for their sound, as well as sense, and arranged carefully, often in short lines (drawing here on a simple dictionary definition of a poem)? Is the appeal to Basho for support of (arguable) injunctions a bit like complaining that contemporary English-language poets, particularly those of Christian faith, do not write enough like John Milton? jp, how do you view modernist developments in 20th C. Japanese haiku? Would you object to haiku in English being influenced by such writing? I agree with what you say, Paul. When we magically conjure a living vision into consciousness, triggered by the word signposts of a haiku, a vivid diorama comes into focus  that we may (in dream mode) step into. At this point we’re doing much more than simply ‘reading a little poem’. Some haijin argue we can enter into a Zen communion with the mystery of being which envelopes us all. A form of active meditation and time travel . . . I do not think this is a hollow syllogism. Nor it is the whole definition of ELH, or ELPoetry. Both are amazing ethereal to define in words without 100s of pages of Doctoral Theses, footnoted, and probably not fine answers even then. On the coarse classification level, what else is haiku? Commentary (Essay), Criticism, Biography, Parody, Lyrics, Script, History, Fiction? No, what’s left is Poetry. And I’m not at all interested in defining “poetry” or entering the associated battles there. The subject is ELHaiku. Not sure I understand T. H. Master’s use of “true” haiku. Good haiku, successful haiku, perhaps? Oppositely indicated by failed or poor haiku attempts? a digression . . . may I call you “The?” — tongue in cheek here. More seriously I have no idea who you are or if, as a previous writer postulated, you are goofing on us. A self-proclaimed Master? The late Peggy Willis Lyles was, I posit, an ELHaiku Master. I called her such in life. There are others in our language, living or dead, but to identify too many is to slight others who might have that status conferred by others upon them. End of obvious digression/   Pace The, I’m not speaking personally. I do think the hoary aphorism “show; don’t tell” has life and value in understand haiku. It leads to the underlying usage that haiku is Art (Capital A), and that ELHaiku as such is an attempt to share emotion, expressed and received (by reader/listener). I agree with Mister Master’s use of mile posts… another old expression in ELH. To share. To share is why we write haiku, and in some way show to another person. We share the bare bones of OUR experience so that a reader/listener can bring her/his own experience to bear and share with US, the writers. Why we write something down? Perhaps because of an awareness of some connection of things perceived, something large or small caught the haiku poet’s attention; something unique to that haiku poet, in a unique time and place. Not limited to some juxtaposition of two concrete or here-and-now images because certainly memory, dream or remembrance, may be partnered with the actual observed. We are not chroniclers in the sense of Thoreau counting Eastern white pine cones piled by red squirrels as in his notebook entries. Yet, without use of the form or any poetic form, Thoreau saw the squirrels, and the rhythm of the pines — cones ripened, nutritious seeds, how they sail on the wind, how the cones are on the uppermost branches, and how squirrels stockpile and prosper or not as a species in a given year. How easily Thoreau could have written haiku, and what a rich book of haiku it could have been. Frogs make sounds, toll booths are open on Christmas Eve, crows roost, beginning of wind moves wood shavings, poets sneeze, turtles climb onto turtles. These are images that are the stuff of poetry and haiku. How a haiku poet employs them makes a haiku a successful haiku: Creator and Receiver. “In most cases it would appear that ritual words are at least as important as other kinds of ritual act; but besides that, and this is an intriguing point, very often (but not always) if the ethnographer questions his informants ‘Why is this ritual effective?’ the reply takes the form of a formally expressed belief that the power is in the ‘words’ even though the words only become effective if uttered in a very special context of other action. scrutinize the spells used without the mediation of material substances, spells which the Trobrianders call ‘mouth magic’ (o wadola). A good example of this category is the magic of growth performed in the middle phase of gardening. The natives are aware that nature must do its work and that the crops have to sprout and grow by themselves. The magician’s function is described by Malinowski thus: ‘In a rapid succession of rites, he has to anticipate each stage in the growth of the gardens, and stimulate the various crucial phases in the development of the plant . . .’ (I965a: I39). In the following examples, taken from formulae I3, I7 and I8 in ‘The magic of growth’ (I965a: ch. 4), I state some suggestive lines and then in parenthesis the native commentary upon them. Formula I3. ‘O dadeda tree that sprouts again and again’. (The native commentary is that the ‘dadeda is a plant of extremely rank growth; we cut it, already it has sprouted’.) The same formula contains other metaphors suggesting speed of growth: ‘Thy shoots are as quick as the eyes of the kapapita, the quick bird, Thy shoots are as quick as the kababasi’a, the quick black ants’. The great difference in Martin’s idea of ‘Poetic Spell’ and THM’s ‘magic spell’ is of course implied in the two qualifiers, ‘poetic’ and ‘magic’. Martin is calling for an awareness that haiku verse *is*, at its best, poetry and that ELH might benefit from its writers considering it as such a little more often. This essay is based on his presentation at the 4th Pacific Rim Haiku Conference in N.S.W. last year. The words of a true haiku deliver the haiku vision according to the primary formal injunction: *SHOW not tell* – only this and nothing more. The words are, in other words, signposts. This is peculiar to true haiku. Although we find the notion of showing to be a widespread supplement to broader literary technique, when employed in true haiku it is absolute. Not an option amongst many options, as in poetry, for example. That is to say, the evoked image does all the work. Not some of the work. ALL of the work. If this is not the case then, whatever it is, is not a true haiku. This is why true haiku is NOT poetry, though it might appear to be to the lay person, at first (or last) glance. Nor is true haiku, prose. A magic spell comes closer, though. Ask yourselves this: “Is a magic spell poetry or prose?” The answer is, of course, neither – though an incantation may use some very basic formal presentational techniques common to both poetry and prose. How much more so true haiku? Thus, with a true haiku, do we conjure a living moment, cast in a spell (sic), for all to enter into and to return to and to be charmed by, and this forever. I didn’t have time to check whether you were quoting from THM’s site or not (you didn’t use quotation marks) But I did want to make it clear that ‘show, don’t tell’, though very useful advice for haiku, is not advice peculiar to or exclusive to haiku. Also, Chris and I cross-posted. I’m a slow old typist at best, and his post immediately before mine wasn’t there when I started. Hi Dafne, I’m sure Lorin meant no offence. It is often difficult to know what people are really saying, thinking, or intending when posting messages in comment threads, forums etc. For example, it’s not clear in your posting paraphrased quotes from THM whether you mean to condone them yourself, or just to present them for general information relevant to the topic. It can easily get quite confusing! Anyway, hopefully THM will drop by some time and share a few of his own thoughts on this. In the meantime, no need for such formality – you can call me Chris! Lorin, thanks for sharing your thoughts. I hoped someone would mention the widespread use of this idea in writing workshops of all types! Ms. Ford, I was just quoting from the THM’s site, in reference to Mr. White’s question to the THM, not making a judgment on its merits. Dafne, I’m sorry to disappoint you, but whether the “injunction to ‘show, not tell’ ” seems ‘visionary’ to anyone or not, it is certainly *not* “peculiar to haiku”. The adage (or advice) is quite common and has been around a long while before its application to ELH. It’s still applied, to this day, in the context of writing classes for fiction and playscripts, as well as poems. Thank you Philip, haha. We slaves live in hope. Dafne – thank you for posting the link. I have visited his website several times already though, and am familiar with his Haiku 10 Commandments project. 2) the claim that ‘show don’t tell’ is actually an injunction at all. Whose injunction? Is it part of haiku’s ‘heart’ (if there is one), as it were, or is it an injunction imparted by an authority of some sort which is external to this ‘heart’? The use of the word ‘poetry’, in relation to haiku, obscures the visionary injunction to ‘show not tell’, which is peculiar to haiku. This is a major stumbling block for most would be haijin, particularly in the prosaic, literary and somewhat egotistically occluded, Western world. Perhaps ‘visualisation’ is more apposite a term to signal a haiku. In the magical sense of conjuring an image to enter into and engage as real. Apparently, the poet Frank Samperi hated the term “masters” because “if there are masters then there are slaves!” An interesting point, though I imagine THM is just having some fun with his masterful stance. Of course masters, particularly Zen ones, are not generally obliged to give clear explanations, but we slaves live in hope of receiving a reply! The Haiku Master – please could you give a clear explanation of why haiku is certainly not poetry? There is an Australian word for that but I would not use it in polite company. Haiku, at its best, is poetry, as is any other kind of verse. It may be other things as well: different things for different people of various persuasions, but that doesn’t make it not verse or, when the verse is good, poetry. Whatever haiku is it’s certainly not poetry, meta-poetry perhaps – but, this still begs the question. Even calling haiku a magic spell simply swings to the other side. No. Haiku is something else again, perhaps whatever forms the apex of these two complementary opposites. Maybe we can call it: ‘zazen in motion which pauses to make a note’. What would be the word for that? Found on both sides of letters. The right side and wrong. Em dash or en dash. To use or not to? One thing haiku may be is an antidote to ‘performance poetry’. Yes, of course. Haiku is always being defined with each new haiku written. In my answer to the question: Is haiku poetry? I immediately said–absolutely haiku is poetry. . .and so much more. Then, of course I fell into the perennial issue of trying to define haiku. In my attempts to describe what haiku is to many non-haiku poets, I try to go beyond the definitions they can get online. I try to offer a personal expression of what haiku can also be, from someone who writes it. Haiku is a way of seeing the world, a way of being in the world, recognizing interconnectedness–and I say that without getting all philosophical /religious. In my response I was trying to convey that haiku is poetry without the human drama and ego which can be found often enough in mainstream literary journals. Also, I would argue that there IS an increase in “redefining haiku” if for no other reason than the increase in internet usage and hand-held devices. How many subscribers get a haiku or some other micro-poem delivered to their cell-phones each day via tinywords.com, for example. Or, 7 X 20, the small poem literary zine via Twitter. Simply, more people are seeing it and therefore more people are asking the question: what is it? And, given the new initiative of the HSA Education Committee to do haiku outreach, this increase will continue. I hope. Peter, don’t you think haiku is ALWAYS in the process of being defined — or redefined? I think this is true in Japan as well as in Western languages, because poetry atrophes and dies if it remains static and definable. Here’s to haiku never been fully definable! Also, I don’t think there’s any particular increase in “redefining” haiku right now — just a standard percentage of people who are new to it who encounter a lot of perennial issues (perennial only because an ever-refreshing wave of newish folks are continually rehashing the same issues as *they* first encounter them). and formal poetry. At least for me. of being re-defined in America, I’d say. An exciting time to be a student of haiku. (both published in Famous Reporter 41 (Walleah Press, Tasmania, Australia), 2010. The previously quoted Seamus Heaney haiku has musicality. It helps to know he’s Irish, as it sounds even better in the brogue. No, it’s *not *lyrical, to be sure,  but it *is* musical. I can almost hear the snare drums over those last three words, the sharpness and speed, and what a contrast with the image of a worm moving of the first part. And with Mark, I’d say that there are many and varied haiku by Peggy Willis Lyles that are musical and lyrical. Peggy had a great ear for sounds in their function of supporting content and helping to create mood, imo. …and of course there are many others. There is more to musicality than rhythm, of course (and I’m no musician) But rhythm is part of music as well as of everyday speech… a drummer might say it’s the bone structure that holds the body of a piece of music together. Vowels in general play a part in rhythm, I think, and assonance does as well as the more obvious end-rhyme. ah, thanks, Tom. Yes, W.C.W was *the* great promoter of ‘the American vernacular’ and his legacy for all EL poets, everywhere, is to remind us to listen to the real voices around us, not only read ‘old poems’. I understand the lineage of your phrase, ‘American haiku’, now. And yes 😉 if more of us ELH writers, world-wide, were to consult W.C.W. and others who have an ear for the vernacular, there’d be less archaisms, less eg. ‘Spirit of Spring!’ and the like appearing in beginners’ haiku. Fine in 1899, but exasperating in 2010. Also, our poems would almost certainly echo more the rhythms of spoken language. American haiku — I didn’t meant to separate it out from ELH. I suppose the aesthetic I was pointing to is “transcultural.”  No doubt in my experience Williams is the great begetter here. I dreamily remember the night I discovered him in the stacks of the tiny East Bakersfield Public Library; that was in oh 1958 or so. His short lines and clean “prose” diction are essential background for many ELH poets, don’t you think? “Can EL attempts at haiku always succeed with musicality, content, syntax etc… Or does there need to be sacrifices made? I would be fascinated to be given ELhaiku examples containing musicality complete with all the other ingredients necessary to make a poem. Alan, earlier in your comment you put “musicality” in quotation marks, I think to emphasize that the word as we are here using it has limitations. With that in mind, here are a few poems I hope might further the conversation. Both Tom and Michael Dylan Welch add some really good points. This is why haiku is endlessly fascinating and attempts to emulate Japanese haiku with its advantage of using non-alphabetic language systems. > would have over an alphabetical one? That would be a great question to ask a series of experts. I was only speaking of haiku in languages other than Japanese, but mostly English-language haiku. We all pretty much know here that haiku is a short poem “time length” wise. I’ve time recordings off the BBC recordings I have, and noticed that most of the Japanese women readers, as well as Western men and women haiku writers, moreorless read out a haiku in six seconds. As I used to do a lot of performance poetry, alongside poetry readings etc…, I timed my poems down to the nearest second. I found that the majority of my own haiku tended to be six seconds long, and that didn’t deviate in any of my live readings as far as I could tell. I suppose a haiku could be, for instance, five iambs long? But would we want that, and nothing else? Are ELhaiku musical? Some are, with some narrative driven, some lyrical, some in each camp “musical”. Could you string a number of haiku together to make a ‘musical’? Anything is possible, and many haiku have been set to music over the decades. I’ve read out English versions of contemporary Japanese women’s haiku while a (electric) bass guitarist played improv with me, and vice versa. This was particularly successful with Madoka Mayuzumi and her “Summer on the B Side” haiku. I hasten to add this wasn’t a paid gig, and I promoted the book. 1.	all sorts of birds;  hundreds (and thousands) of birds—Archaism. A whole paragraph of meaning, in poetical language too. I just think that the Japanese and Chinese language systems have an advantage over us in both sound and being able to say a paragraph of meaning in just one combined word construct. Also, not all of us have the prime reason to create musical poems, or poems with musicality. I find haiku comfortably contradictory, constantly challenging, because it can’t really be pinned down, even by seasoned Japanese experts. Even Basho was looking into new things as he lay on his deathbed. I can only speak for haiku for the moment. Most of only read Arabic and Indian haiku in a English language version or it’s originally written in English from the start. > to hear Japanese being spoken in real life, though. All languages have one thing in common: a native speaker can butcher their own language, or make it sound like the most beautiful of all languages. I’ve travelled widely through India; Japan; Australia (Queensland and Northern Territory, but worked with Aussies from all over, in landcare); Europe; and places in Malaysia; USA; and Britain. > the language/s we know. We all know that different languages can create marvellous unique literature. I wish I knew Danish intimately because I know that no-one has caught the flavour and extreme wordplay of HC Andersen. I’ve heard that Shakespeare has been translated into Klingon, and I bet that is fascinating, and possibly the “Henry” plays would be fantastic, although Christopher Logue has done a terrific job in capturing the musicality of brutal battle in English of course. But haiku remains a challenge, even to national/international mainstream poets who attempt to force their perceived musicality into haiku and often fail in my opinion. > We all have an ‘ear’ for ‘false notes’ in our own language…eg. ‘Tontoism’ in ELH…. which disrupt the rhythm. Just relating to haiku, nothing else, I wonder if we add both ingredients: “musicality” and “content”? Possibly French haiku is more successful than ELhaiku? The French have been writing haiku longer than other European countries or N.American countries, other than the Dutch of course. Can EL attempts at haiku always succeed with musicality, content, syntax etc… Or does there need to be sacrifices made? I have my own examples of course, but would like to see others supply their own. Tom, one of the characteristics of Bruce Ross’s *Haiku Moment* anthology is that it’s very nature-focused (I think he makes a statement about the book needing to be “corrective” in that manner). I consider this to be a weakness in the book, although others might consider that to be a strength. Either way, I think that focus is at the heart of the reason why you find a lack of echoes to other poetries in its selection. Its narrowed focus on “nature haiku” might be why many of its poems lack those other echoes you sought, especially cultural echoes (which are necessarily human, if one insists on thinking of human as separate from nature). I think you’ll find more variety (and perhaps more music?) in Cor van den Heuvel’s anthology. Haiku, to me, is a lyrical genre of poetry. Some people may not think of it as lyrical, or even capable of lyricism, but I believe it’s possible to make music in haiku — and we see this all the time in both Japanese and English-language haiku. …typo : ‘Australian haiku editor’. Tom, are there any major or clear differences between what you call ‘American haiku’ and the haiku of eg. the U.K., Australia, New Zealand and other English-speaking countries? One reason I ask is that I recently received a submission of haiku (to ‘Notes From the Gean’) prefaced with a note that the ku were to be regarded as ‘American short  poems’. I was a tad nonplussed, as the poems appeared in every way to be of the ELH genre and submissions to the journal are required to be accompanied by the country of residence of the author. Also, it seemed, well, odd, to ask this of an Australia haiku editor. I can’t imagine myself prefacing a submission with a note that the editor should regard my work as ‘Australian short poems.’ If any of the subject matter was particularly Australian and I felt it might be obscure, I might include a short note or reference. I am not talking about haiku written from a sense of place vs generic ‘haikuland’ or ‘Japonaise’ ku, I mean what are the characteristics of ‘American haiku’ which distinguish it from other ELH? struts of the haiku form — has been replaced by a different muse. Interesting! Can you tell me how, in relation to rhythm ( a quality of sound sequences), what advantage a non-alphabetical language would have over an alphabetical one? Leaving European languages aside for the moment, it doesn’t seem to me that either Arabic or the Indian written languages would have less advantage in relation to rhythm than non-alphabetical languages. Neither would languages without a written form, such as the Australian native languages before colonisation. Where I live, I hear many languages spoken, including these two, quite regularly, though I don’t understand them. I’m not in a position to hear Japanese being spoken in real life, though. Spoken languages have rhythms. One of the functions of written language is, to varying extents, to notate rhythms of the spoken language (when it’s not just a list eg) Playing/working with rhythm is part of the craft of writing, whether one is attempting to render dialogue in a play or novel or an inner or outer ‘voice’ in a poem. Written language plays with our memory of sound patterns (as Tom mentions), our understanding of/ familiarity with the sound patterns within the language/s we know. We all have an ‘ear’ for ‘false notes’ in our own language…eg. ‘Tontoism’ in ELH…. which disrupt the rhythm. I have no other language, only English, so I’m interested to hear from you and anyone else in a position to help me understand this. The fact that non-Japanese poets are getting better and better at delving into this area is a fascinating process, and we have moved on so far from “Western haiku” in the 1990s and earlier. If you have any examples Tom, I would be delighted to see them, as would other readers here. It has been a challenge to attempt to use “kigo” in the same way as a Japanese writer does, and the ongoing development of “keywords” by both Japanese and non-Japanese haiku writers is essential as a “para-kigo” mechanism within haiku. The question of what form or rhythm might be the best approach for haiku in English is an endless discussion because I don’t believe there’s any single answer at all. Without their even needing to think consciously of the matter, what are the leading English-language haiku poets and translators doing? What they do over and over is come up with “musical phrases” (as Pound exhorted — thanks to Lorin’s post for bringing that up). How do you define the musical phrase? They’re as varied as all of music itself. And that’s the way I think haiku should be in English, while the poem also considers additional targets such as season word, a two-part juxtaposition, and so on. I should also add that I don’t see any deficiencies in English rhythms compared with Japanese — in fact, I see English as being far richer in this regard. Both languages have different strengths, and we should take full advantage of the strengths of English and use the various rhythms at our command. We need not pretend to be Japanese with our haiku, nor fall into a dull metronome rhythm, as Pound also warned against. The Japanese rhythm of 5-7-5 is not a dull metronome rhythm, but it is a *Japanese* rhythm, not an *English* rhythm. Here’s to the variety of rhythms in English-language haiku. This may have some bearing on ELH and the current discussion. III. As regarding rhythm: to compose in sequence of the musical phrase, not in sequence of metronome. Very interesting, Christopher, thank you,  and I’d like to hear more, too. So every Japanese sound unit is counted as a beat? I’d got the impression that Japanese didn’t have the variety of stressed and unstressed sounds or that of longer and shorter vowel sounds which English has, but I certainly hadn’t realised that every Japanese sound unit counts as a beat! That in itself would make Japanese and English so very so very, very different. Iambic pentameter has been said by some to be the metre which most closely approximates the ‘natural’ spoken rhythm of English. But old English verse was based on rhythm, not metre. There is an essay somewhere by someone which, I’m told, demonstrates that Shakespeare, whilst writing in metre, also managed at the same time to embed the rhythm of the old sagas and ballads, which is counted in beats. I don’t have it, nor have I read it, but I will try to find it. “First of all, please remember that the 5 / 7 / 5 rhythm of Japanese haiku is not of seventeen syllables but seventeen beats. These seventeen beats are like the pulsing of the heart of the Japanese language. Given this, two things are apparent. First, a Japanese haiku composed of seventeen beats is acceptable, even if it does not necessarily have seventeen syllables. Moreover, there are also haiku with 5 / 5 / 7 and 7 / 5 / 5 beats. However, if rhythm is considered unnecessary from the start, the result is not a haiku. Haiku is poetry, and rhythm (beats) is the life of poetry. If the governing principle of the 5-7-5 pattern is rhythm, then in English could it be something like iambic pentameter? Obviously there are an array of common sound patterns littering our language and the iambic pentameter is but one… are there an inherently greater variety of rhythms in our language than in Japanese? That is a question I would be interested to hear more discussion about. Also, in Japanese, are there other very common, near-fundamental, rhythmic patterns beside 5-7-5 or 5-5-7 or 7-5-5? Does anybody know anything about that? Finally, Hasegawa’s linchpin seems to be that “rhythm (beats) is the life of poetry”. However, that is contestable, and presumably if we choose to take a different opinion we would still be able to produce haiku… or would we not? How essential do we feel rhythm to be in our haiku? How essential is it to the Japanese? (Other than Hasegawa Kai). It is not unheard of for poets in our language to actively speak out against rhythm in poetry… George Oppen was one who did precisely this. I imagine there may also be many in the Language Poetry movement with similar views, and numerous others from elsewhere too… in any case, if rhythm goes out the window for whatever reason, where would a haiku stand? There are probably many other questions which could spring out of this, but I’ll leave it at that. Any thoughts which anyone may have on these matters would be of great interest to me, and I look forward to reading any responses. Thanks for your kind thoughts, Lorin ! but my legs ache when I do the sit and stand exercise and my arms ache when I strech the invisible bow and my heart is quiet when I can keep “in touch” and hit the target once in a while. Speaking of poetry & tennis nets in relation to poetry/ EL haiku, I wonder if it might be helpful, Gabi, as someone who has been taught a certain form of archery & these days practises it without bow & arrow or target, if you could determine, from your own experience, the difference between these two ways of practising archery? Though bow, arrow & target are gone, you still call it ‘practising archery’. Your current practice can be likened to ‘playing tennis without a net’ that Frost wasn’t keen on, can be likened to ‘free verse’. Another thing you can bet on is that the real EL haiku poets will not obey such dictates. They will be too busy exploring the possibilities of EL haiku in their own ways and will want to be authentic to their own understandings. ‘Free verse’ and the ‘New Formalism’ can and do survive side by side, and they have more in common than those who take a superficial, disparaging glance at ‘free verse’ would even suspect. All poetry has recourse to some elements of prosody. I think that this can apply to EL haiku as much as to any other kind of poetry. There have even been a couple of well-known ‘mainstream’ free-verse poets who were syllable-counters in some of their mainstream ‘free-verse’ poetry: Marianne Moore and Kenneth Rexroth, as well as a more recent, less well-known, sometimes syllable-counter, Bill Knott. And there may be others I’m forgetting. And regarding haiku, there is the editor of the Asahi Haikuist Network, David McMurray who, the last time I checked (and it’s been a while) is an ardent proponent of ELH written in a 3-5-3 syllable format. I know I have read articles castigating ELH written in 5-7-5 syllable count for the mere fact of being written that way, regardless of the quality of the haiku written that way. Even being shorter, and therefore more like a Japanese haiku (in some people’s eyes), would the regularity of a 3-5-3 haiku make an ELH less acceptable as a haiku, since it still has a ‘set-form’ in English? I have read definitions of ELH that say ELH should be no more than 10-12 syllables (or even 9-11) in length in order to approximate the brevity of a Japanese haiku (a prescription which has always struck me as a bizarre attempt to somehow erase the differences in grammar and syntax between the two languages). Isn’t putting an upper limit on the acceptable number of syllables in an ELH a modified form of syllable counting? Rightly or wrongly, the editorial standards and contest rules I appreciate the most are the ones that, while encouraging the writing of ELH in as condensed a manner as possible, still permit ELH of as many as seventeen syllables, even though seventeen English-language syllables is a rather artificial (given the grammatical and syntactical differences betewen English and Japanese) hommage to what seems ‘natural’ in Japanese. Which raises the question, at least for me: what is a ‘natural’ form regarding haiku in English? Is there an ‘organic’ form that is ‘natural’ to English? To be able to determine whether such difference existed or not, one would have to have a good understanding of what ‘free verse’ is, in its origins and its variety. Is everything written in 5-7-5 English syllables haiku? Is everything written in 5-7-5 Japanese sound units haiku? How would we determine the difference a Japanese haiku and a Japanese community bus stop announcement, if both were written in the pattern of 5-7-5 Japanese sound units? P.S. Regarding the reasons why 5-7-5 persists in English, I think one of the reasons is because of the influence of the Japanese themselves. I think it is often they who don’t sufficiently realize the difference in languages. That being said, writing 5-7-5 remains a choice, just as one could choose to write 3-5-3 beats or short-long-short, or something else. But while making that choice, one had better also hit some of the other vital targets too. The problem with the “myth” of 5-7-5 is that it causes the vast bulk of the public to think that’s the ONLY target. It’s that exclusionary aspect that’s so damaging — not the specific pattern itself. I still have a hard time determining the difference between free verse and ELH. But I vote for haiku being poetry. Yes, Larry, the reason that most mainstream poets today, if they try writing haiku, usually write with a syllable pattern of 5-7-5 is *because* of the urban myth. That’s all they know. I’ve had the occasion to casually ask numerous famous poets about their understanding of haiku — and they’re nearly all victims of the urban myth. It’s pervasive, and very sad. Of course, one *can* write good haiku in a 5-7-5 pattern. The “myth” is that that’s the only target for haiku, or that 5-7-5 ever should have applied to English in the first place. There may be people who yearn for structure, but that’s an individual poet’s issue, not an issue of the poetic genre itself. Some people claim that they like the “discipline” of counting syllables in the 5-7-5 pattern. Okay, fine. Yet nearly always their poems are slovenly undisciplined (or, more accurately, ignorant) regarding the more important aspects of season word, cutting word, and primarily objective sensory imagery, etc. I’ve seen this a thousand times for every time a person who IS aware of these other necessities. These other disciplines are far more difficult — as is, I would say, the discipline of fitting haiku to an “organic form” (as described by Denise Levertov). I continue to be puzzled by the deep-rooted psychology that makes so many people cling, and so tenaciously, to what they learned (mislearned) about haiku while in school. …and what sort of general relationship between Man & Nature is implied in Heaney’s haiku, though done humorously? This haiku has layers and raises questions. Lovely quote from Auden, Philip. So, why do some mainstream poets today, if they take a stab at writing haiku, tend to write their versions of haiku using a 5-7-5 English-language syllable count? Is it just because that’s all they know about what makes a haiku a haiku? My theory is that a lot of poets, even free-verse poets, yearn for structure, secretly or sub-consciously. That is why even the freest of free-verse poets will try their hand from time to time at writing ghazals, sonnets, villanelles, sestinas, triolets, even syllable-count haiku! Does “where nothing / will grow” have the same problem as “so much depends / upon” from The Red Wheelbarrow? Yes, Catherine, I believe 5-7-5 is an urbran myth — and it has become an urban myth BECAUSE of its being taught incorrectly or superficially in schools (a problem that has been going on for decades). Nearly all textbooks and curriculum guides are deeply ignorant of what the majority of leading poets and translators are doing with haiku in English, and have been doing for 50 years. They are blithely unaware that haiku in Japanese count sounds, not syllables (the word “haiku” itself is two syllables, but counts as THREE sounds in Japanese). What’s more, the way haiku is mistaught in English has led to an almost uniform lack of knowledge of season words and juxtaposition, let alone primarily objective sensory imagery — and it’s also commonly taught as a nature poem, when “seasonal” is more accurate. If 5-7-5 isn’t an urban myth in the English-speaking world, then it comes mighty close. P.S. Perhaps an old essay of mine, “What Is a Syllable,” online at https://sites.google.com/site/graceguts/essays/what-is-a-syllable, would be of interest? In the Heaney, it’s that through his use of language the pavements and the ice become animate threats, or on the verge of being animate threats. There is the ordinary, mundane world and there is also, co-existing with it, this other, stranger world, though it is done with light humour. The world of ordinary perceptions and another world glimpsed at the edges of ordinary perception. If one aspect of haiku is that haiku create a breach, gap, caesura in our usual reading of the world which momentarily fills with a different kind of perception, then Heaney’s is a haiku which does this very well. 🙂  This one gives me a smile, too. I’ve been recalling a sign up in the Grampians, obviously placed there out of kindness to tourist campers. Something like, ‘Danger: Gum Trees Shed Limbs Without Warning. Do NOT Camp Near.’ and imagining the difference if it had’ve been, ‘Warning: Dangerous Trees’. The best & clearest danger sign I’ve seen was a home-made one up near Cooktown, painted on a bit of tine and nailed to a post, also out of kindness to tourists. It read just ‘danger’, painted in red, but underneath was a graphic green & yellow painting of a crocodile’s open jaw & eye. I know I made tracks back to the car very quickly. Lorin, I like your analysis of Mr. Heaney’s haiku. I have been thinking about how this haiku might be re-written to conform to how the ELH haiku world thinks a haiku should sound / appear, at least as I understand it. I think this pared-down version makes the reader do a little more work than the original, although that’s not necessarily a bad thing. But it does seem to me to sound a little ‘flatter’ than the original. And icy pavement isn’t always seen as dangerous–just watch kids (or adults for that matter) having a good slide! Is this a haiku? I remember hearing Mr. Heaney read this, and then hearing him state how proud he was of the fact that it conformed to a 5-7-5 English syllable count. I agree, it’s a haiku and a very good one at that. Not *because* it conforms to a syllable count, but I think that using a 5-7-5 syllable count is *one* of the possibilities, one of the choices of form in ELH. This one flows in the natural rhythms of the language, is not ‘padded’, has great humour and pathos as well..
‘Dangerous pavements’… while the general advice that adjectives are better avoided in haiku is good advice, here the adjective is central to the ambiguity which allows the humour. Here is a writer who shows us the delightful potential of the word. Pavements are an artifact of civilization, of cities (ask the Ancient Romans) Nothing could be further from the unexplored wild. Yet here they are ‘dangerous’. In what sense could a pavement be dangerous? Ah, when they’re covered with ice, there’s the danger that one might slip and fall over. For an older person, this could lead to broken bones and complications, yet still the pavements aren’t *actively* dangerous in the sense that eg. a crocodile or a taipan is. What does it mean to ‘face the ice’  with a stick? Yes, common sense will have us arrive at the conclusion that here is someone who has his father’s walking stick to help prevent him from slipping. But not before an only slightly absurd image of an adventurer of earlier centuries facing wild animals in the jungle with an inherited stick occurs. The two images, a man on slippery pavements with a walking stick and an adventurer facing the dangers of jungles in deep Africa or the Amazon, straight out of ‘Boys’ Own’ stories, remain inseperable. So on the one hand we have a scene of ordinary human pathos: the “I” of the poem seems to have inherited a walking stick from a father who’s passed away. He is no longer young, but gains a sense of courage and comfort from facing the normal dangers of Winter (Winter of life as well as the season) with his father’s walking stick. We are reminded of old age and death, but we live in a civilized place, a town or city, where the most dangerous thing is a slippery pavement. On the other hand we have an adventurer actively facing an active, aggressive danger, wielding a potent stick. There seems to be quite a bit of ‘Walter Mitty’ in the persona, the “I’, of this charmingly humorous haiku. I would be proud to have written such a haiku. I apologize for making so many posts on this thread, but I remember why I don’t have Billy Collins’ book, She Was Just Seventeen. I heard him read from it at the National Arts Club on Gramercy Park in Manhattan back in May of 2007, as part of the reading for Cor van den Heuvel’s book, Baseball Haiku. After I heard Mr. Collins read from his book, I wasn’t interested in buying it. After all, $20 here, $20 there, and soon enough you’re talking about real money. 5-7-5 is not just an “urban myth;” it is what is taught in many classrooms, which is one reason why Berry Blue is so necessary. Is his use of the descriptive adjective “dangerous” too much telling rather than showing? I think it is a haiku, as much as any close approximation of the Japanese verse form called by the Japanese a haiku can be in the English lanaguage. 1) All haiku are poetry, as much as all tanka are poetry. Haiku are a genre of Japanese poetry. 2) The Red Wheelbarrow is an English-language poem written by William Carlos Williams. I don’t believe his intention was to write an English-language haiku in writing this poem. Could this poem be a haiku? It would be interesting to see it translated into Japanese, in a way that would make it seem like a haiku to a Japanese reader, if it could be. If I were translating this poem into a Japanese haiku, I would probably do away with the white chickens as being extraneous but I would try to keep some sense of “so much depends / upon.” I have no problem with Williams telling us that the wheelbarrow has more importance than its mere existence as a wheelbarrow. He leaves it totally open-ended as to what this dependency consists of. 3) If haiku is a traditional form of Japanese poetry, a view I suspect a majority of Japanese commentators / critics would accept, then this haiku is a form of traditional Japanese poetry. 4) I have no idea, but I suspect there are. If one is interested, one could check Poet’s Market published by Writer’s Digest. 5) I have no idea how Billy Collin’s book of haiku has been received. The few reviews of Sonia Sanchez’s book of haiku, Morning Haiku, that I have read have been favorable, but those reiews I have read were written from a ‘mainstream’ poetry perspective, not from an ELH poetry perspective. I have browsed through Ms. Sanchez’ book, and most of what she has written there would not be considered haiku by historic or contemporary generally-accepted standards of ELH definers and editors. 6) I have only read one review of Ms. Reichhold’s book, and it was unfavorable. It was written by someone fairly knowledgable about haiku. I own the book, and I refer to it. As with any translator, from any language to another, some of her translations seem and sound more successful than others. 7) A Japanese lyric verse form, etc. However, this definition is by no means all-encompassing. Have Japanese scholars agreed on an all-encompassing definition of this Japanese verse form? 9) Being an admirer of Ms. Brooks’ poetry, I will go with “life distilled.”  However, I’m sure there have been many other equally-charming definitions of poetry made by equally well-respected poets. What I find interesting about the ‘distilled’ part of “life distilled” is its uselfulness as a way of differentiating lyric poetry from prose fiction. Hwoever, this differentiation doesn’t preclude some overlap, especially when lyric poetry gets longer, and prose fiction gets shorter. There are always exceptions. 10) It’s complicated. But since I have been espousing the position that haiku is a form of poetry, then I have to say all haiku, provided that what is being referred to as haiku is in fact haiku, is poetry. And haiku being a form of poetry is not contingent on whether or not the haiku is a good haiku, or even a good poem. I think a good haiku will tend to be thought of as a good poem, but even a mediocre haiku might pass muster as being a good poem. In other words, a haiku that may not conform to the broadly accepted requirements for what makes a haiku a haiku could still be a good short, free verse poem, or even turn out to be a short poem of a recognizable non-haiku genre, such as a poetic epigram. P.S. the above has not been carefully and thoroughly proofread, so please excuse any typos, misspellings, etc. Leaving only the problem of distinguishing good from bad poetry? I believe that haiku (either Japanese haiku or Western haiku or whatever haiku) is poetry. The problem is not “is haiku poetry” but the idea that anyone can define what “poetry” is in such a way as to include or exclude any form of writing. I’ve seen those walls come tumbling down way too many times. I love haiku. This statement has confused even the Japanese poets with whom I’ve become friends. It is not easily comprehended that love can be applied to haiku, a form of poetry. My path, continued life experience, if you will, is by choice entwined with this Japanese genre. I believe it is close to the ripe time to cut away from the Japanese genre haiku and claim a genre, although similar to haiku is in fact its own genre and not haiku because haiku is really an exclusively Japanese genre (for reasons I will not explore in this comment). So, let’s write in this evolving new genre and explore what it is and should become, with one firm restriction, the genre is not Japanese haiku. I agree with Gabi Greve’s, “It’s complicated.”; and, might add it’s getting unnecessarily complicated. Frankly, I’d really rather write poetry and am less and less concerned about my right to be right. haiku and free verse. It’s a splendid way to answer, the questions which were provided, in an essay form. I’ll add “Anecdote of the Jar” by Wallace Stevens for the THF’s readers’ convenience. I think W.C. Williams’ “The Red Wheelbarrow” offers, if not a contrast, then certainly something that ELH haiku has for the most part eschewed: and that is what makes for the essence of cultivation, what makes of the world a world, what makes disparate elements of nature communal, of humanity. This, I believe, distinguishes ELH from Japanese haiku, where the Japanese emphasize the so-called seasonal reference only inasmuch as it is a part of the human world. We tend to try to present, preserve the pristine view of nature, very  much in keeping witht the position taken by Leo Marks in his classic book “The Machine in the Garden.”  For Marks, and for Americans in the 19th Century and before, America was viewed as a new Eden and there was no need (at least in the imagination) of allowing the intrusion of technique, of instrumentality into this pure space, this second chance at Eden. It was God’s and we would not tamper with it, not again, no,we would forsake attempts to sully creation. And, I think, if we are looking for a reason why haiku took hold of the imagination of Americans, in particular, it was in order to continue this “natural” view of America, this initial view of an America still pristine and free of the intrusion of the machine and modernity. Whether “The Red Wheelbarrow” is a haiku or not is irrelevant to me from this perspective. What makes it such a strong poem is what a haiku poet would ordinarily object to: that phrase “so much depends upon.”  While this might seem explanatory, it really is demonstrative of the subject, is the subject: a wheelbarrow is what is depended upon, is what things depend upon in order to be maneuvered, carried, carted; is what we, as humans, depend upon to join the world into a world. And the poem’s form is essentially tripartite, like a wheelbarrow; each stanza has three words, like the three wheels of the barrow, and ends with the emphasis on that one word, like the wheelbarrow depending upon that one wheel in front that makes the balance possible. And it is the wheelbarrow, that ancient and most human of inventions, that brings together nature into an order, an order it otherwise lacks. I don’t think we have a comparative haiku poem, because we do not generally view even rudimentary, ancient technology as admissable. There are exceptions, rare; I can only think, off hand, of Dee Evetts haiku about wood shavings, but the plane, the contrivance, the man-made is not the center of this poem the way the red wheelbarrow is in Williams’ poem. The Japanese, on the other hand, have many poems about fulling blocks, and hoes and other devices that, like Williams’ poem, bring the seasons into the human order. I think our haiku,because it is written in a modern and post-modern period, is nostalgic for the time when America was first “discovered” and responded to as the new Eden. I think much, much can be learned from Williams’ poem about what makes of rain and chickens seasonal: and that is the human community and its contrivances. So much depends upon us to make the hill rise up to an empty jar. 1. Some haiku are poetry, as some of any other kind of poems anyone might care to name are poetry. But what is poetry? 2. No, it’s not a haiku. It has too many syllables, just for a start. 🙂 But it’s a good Imagist poem and can assist us when finding connections between haiku and other kinds of poems. You could make it into a haiku for demonstration purposes by cutting bits out and juxtaposing the images, maybe adding something, fiddling, but your demo haiku would be inferior to WCW’s perfectly poised poem, so why would you? 3. I believe this is a translation of a Japanese poem. I believe that this translation gives us the content and something of the sense of the original, but probably the part of the poem played by sounds and rhythm have had to be sacrificed to a great extent..
4. Adding to Michael’s list, ‘Famous Reporter’, published twice annually by Walleah Press, Tasmania, has had a dedicated haiku section since 1994. The haiku are not used as fillers, but are published with other contemporary poems, essays and reviews.published about 50 haiku. Saltlick Quarterly (unfortunately shortlived) out of Melbourne, published some sets of haiku along with other contemporary poems. 5. I don’t know. I’ve not read it, nor the reviews. 6. I believe it had a mixed response from reviewers but the sales have been good. It’s accessible and enjoyable to read. Yes, it’s a short poem but… so is a limerick, so is William Blake’s ‘The Sick Rose’, so is T.S. Eliot’s ‘Lines to a Persian Cat.’ Examples are better than definitions every time, as far as poems go, I believe. 8. None of the above. 9. Possibly all of the above, in someone or other’s opinion. I really don’t care for any of these opinions. 10. um… I should’ve read the last question first. Being of sound mind, I’m obviously not qualified to answer this. None of the offered statements has any appearance of truth whatsoever. 1. Some haiku are poetry. But that’s because some attempts at haiku simply fail. As a genre, haiku is poetry, of course. I’m deeply puzzled by the assertion that some people have that haiku is somehow anything other than poetry. Haiku can be many additional things (diary entries, awareness practice, therapy, etc. ), but they start by being poems. What’s the point or value in thinking that they’re anything other than poems? 2. The red wheelbarrow poem is not haiku. Haiku traditionally eschews such concepts as “so much depends.” That’s exactly what a haiku should never say — because it ALREADY says it without saying it. Indeed, the point of every haiku is that “so much depends” on the image you experience therein, if we would wake up and pay attention. The rest of the red wheelbarrow poem is very haiku-like because of its imagism, however. I use this poem to illustrate specific differences between haiku and not-haiku. Another poem like that is Robert Frost’s “Dust of Snow,” half of which is somewhat haiku-like because of its carefully seen image, the other half of which is everything that haiku tries to imply rather than state. Also worth discussing is the form. Williams carefully places single words by themselves to end each pair of lines. This is a very conscious act (it makes me aware of the poem’s form and affects its pacing, both visually and aurally). While I wouldn’t object to a limited amount of this crafting in haiku, the extent of it here (repeated four times) seems a step away from haiku. The aspect of form here seems like a jewel on the finger, and I see too much of the jewel rather than the moon the finger is pointing to. I don’t think haiku has to be just in three lines or one line, but the form of this particular poem seems to be too far from haiku. I would also say that the last six lines, while a strong image, still aren’t quite haiku because that part of the poem lacks the juxtapositional structure common to most classic haiku. 3. Hamill’s translation of the Issa poem seems a bit choppy and awkward in this translation, but it’s certainly in the continuum of haiku, with a clear image, and a bit of a twist/surprise/irony. It feels a bit explanatory for haiku, but I’m okay with it. Haiku has range, and this falls within that range, at least for me. But the question is whether this is a poem, not whether it’s a haiku. Of course it’s a poem. Why not? 4. Well, there used to be Tundra and Hummingbird. Not sure if Brevities is still running. To that I would add, more currently, Noon and Lilliput Review. With Tundra, one goal was to integrate haiku with longer poetry. Haiku has kept itself in a ghetto of its own making for too long. I don’t quite like the phrasing in this question — to publish both “poetry and haiku”. Haiku IS poetry. So a better question would be to say “longer poetry and haiku”. I sure wish haiku books were more often reviewed by mainstream poetry journals. What we in the haiku community should do more often is send our reviews of good haiku books or anthologies to journals that regularly publish longer poetry. 5. Billy Collins’ book, *She Was Just Seventeen*, received both favourable and unfavourable reviews (and discussion), as I recall. Some people think it’s only sometimes haiku. It’s still an important book (because Collins is an important mainstream poet), even if it might be on the fringes of haiku. Some of the poems are very striking, whether they are haiku or not-haiku. I think many of the poems are good haiku, although not necessarily great. I think it’s wonderful that Billy Collins has respected English-language haiku enough to give it a serious and relatively well-informed try, in contrast to various other poets who have written haiku in what might be called a very selfish or self-serving way, or in a way that thinks of haiku having only one target (how sad that so many people think that 5-7-5 syllables is the only target for a haiku, or even that that’s a target for English-language haiku at all). 6. I believe the book has received both favourable and unfavourable reviews. Of the reviews I’ve seen, the ones that seem the most accurate and well-defended, however, seem to be unfavourable, calling into question the accuracy of the translations. Most of the favourable reviews I’ve seen seem to be less informed about haiku and translation. But of course it’s all still poetry, and I’m glad to have the perspective these translations offer. 7. Haiku is . . . not the record of an event: it is an event. Of course, there’s much more to it than this, and each answer has its pros and cons. 8. None of the above. Of course haiku written in English can be and IS haiku and can be and IS poetry. I believe Basho, if he knew English, or could read translations, would love English-language haiku (and haiku written in other languages). 9. If any of these choices, life distilled. I note that the question ask about “poems” and not just haiku. 10. It’s both complicated and simple. I sincerely mean that. P.S. E. E. Cummings should have the proper initial capitals, as is the longstanding policy of his publisher (Liveright) and the E. E. Cummings Society, despite popular belief to the contrary. See http://www.gvsu.edu/english/cummings/caps.htm. This issue is like the urban myth of haiku having to have 5-7-5 syllables in English. are we talking bananas or sumo ?